Host team Austria has qualified for the semi-final following an exciting match against the Brazilian squad. After the Austrians pulled ahead with a 2:0 lead, the Seleção bounced back and took the third set. The fourth set was a tight affair until the very last point: at 14:14 the Brazilian team is not able to defend a perfectly played ball by Austria’s attacker Ines Mayer. The hosts thus secured a 3:1 victory in sets, and now face the winner of the match Argentina versus Switzerland in the semi-final. “Before this game today we analyzed the Brazilian team and adjusted our line-up. We found a way to get control of the attacks. Our heads were in the game for the entire match and we played extremely concentrated. Everything worked out great for us and we are just so incredibly happy right now”, said Austria’s Teresa Pichler after the game. Defending champion Germany has also advanced to the round of the last four by winning against Switzerland with 3:0. “This win against the Swiss team was very, very important for us so we can save our strength tomorrow. It was also important for our self-esteem, because it was the first team who put up a good fight”, said Germany’s defender Annika Bösch. The German team now faces the winner of the game Poland versus Brazil in the semi-final. The surprise of the day was newcomer Poland who beat the experienced Italian side in a nail-biter and thus secured at least the sixth place in the tournament. The Argentinian team also advanced with a win over Serbia. The losers of these two matches – Italy and Serbia – now play against each other for the seventh place in the tournament. As a novelty, this year’s World Championship features the President’s Cup. The two losing teams of the qualifiers for the double elimination – Belgium and New Zealand – and the Czech Republic who had finished sixth in Group B at the preliminary round will all play each other in a round-robin format. The two winners of these duels will then face each other again in the final of the President’s Cup – the winner of that match will both win the President’s Cup trophy and take the ninth place in the tournament. 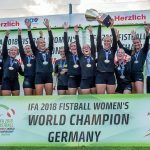 The IFA 2018 Fistball Women’s World Championship continues tomorrow with eight games.